The campaign office of President Muhammadu Buhari has blamed the opposition Peoples Democratic Party (PDP) for the postponement of the 2019 presidential elections. Mahmood Yakubu, chairman of the Independent National Electoral Commission, announced at about 2:40 a.m. Saturday that the election had been postponed, barely hours after Nigerians were set to hit the polling units. The elections would now hold on new dates scheduled as February 23 for presidential and national assembly elections and March 9 for governorship and state assemblies elections. Mr Yakubu said the announcement came hours after a string of strategic meetings were held by top INEC officials to review preparedness for the exercise. It was concluded that a rash of logistics challenges that arose on Friday informed the postponement. Ekiti, Niger and Taraba states were identified as some of the states that faced glitches of distribution of voting materials that would be difficult to resolve in time for the elections Saturday morning, thereby forcing the postponement. Nigerians online expressed severe disappointment in INEC’s eleventh-hour decision, with many criticising the umpire for displaying stark incompetence since it had four years to prepare for the exercise. Festus Keyamo, a spokesperson for Mr Buhari’s reelection campaign committee, also expressed sadness about the development, and quickly heaped the blame on the PDP in a statement released minutes after the announcement. “We condemn and deprecate this tardiness of the electoral umpire in the strongest terms possible. “President Muhammadu Buhari had since cooperated fully with INEC by ensuring everything it demanded to conduct free and fair elections were promptly made available to it. “This news is therefore a huge disappointment to us and to our teeming supporters nationwide and around the world, many of whom have come into the country to exercise their franchise. “We do hope that INEC will remain neutral and impartial in this process as the rumor mill is agog with the suggestion that this postponement has been orchestrated in collusion with the main opposition, the PDP, that was never ready for this election. “We note that all the major credible demographic projections have predicted a defeat of the PDP and it seriously needed this breather to orchestrate more devious strategies to try and halt President Buhari’s momentum. “It did the same as the ruling Party in 2015, when it realized the game was up, by orchestrating the postponement of the 2015 elections by six weeks. Now, it may be up to its old trick again. “We have earlier raised the alarm that the PDP is bent on discrediting this process the moment it realized it cannot make up the numbers to win this election. We are only urging INEC not collude with the PDP on this. 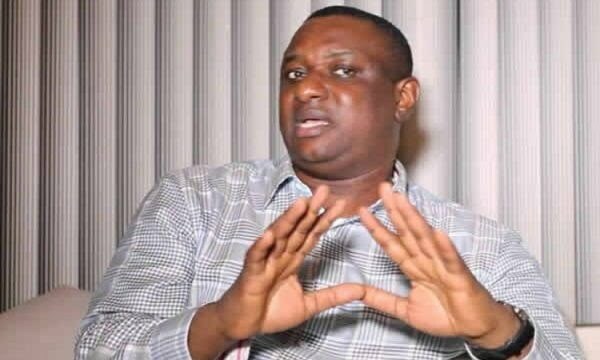 “We are truly worried because as early as Friday morning, some known PDP Social Media influencers unwittingly announced this postponement, but quickly deleted the message and apologized to the public that it was fake news,” Mr Keyamo said. The spokesperson also urged Nigerians to support INEC in its challenges, and prevent the commission from being compromised by the opposition. “We do not want to be forced to a situation of announcing our total loss of confidence in INEC, because we know where that would leave our democracy. “It is in the light of the above that we wish to appeal to Nigerians and our supporters to be patient, calm and resolute despite this temporary setback. “Let us not give anyone, especially the PDP, the opportunity to plunge this nation into a crises, which is what they earnestly desire. Its imminent defeat is just a few days away. “Lastly, we wish to draw the attention of INEC and the world to observe that the PDP has clearly and openly said it plans to announce parallel results through some funny device it has procured or developed. “We wish to reiterate that it is only INEC that is legally and constitutionally empowered to declare results and it constitutes an offence for anyone to do so. “We urge INEC to speak up now and warn the PDP to desist from this ignoble act that is capable of plunging the nation into a crises of immeasurable proportions,” he said. Mr Keyamo did not attach any evidence to corroborate his claims against the PDP or other opposition elements he accused in the statement. A spokesperson for the PDP did not immediately answer calls seeking comments in the early hours of Saturday morning.